The Mirage 2000D is a variant of the Mirage 2000 tasked with conventional strike missions. It is a modification of the Mirage 2000N, which is tasked with nuclear strike missions. A total of 86 units were built and the first aircraft joined the French Air Force in April 1995. The Mirage 2000D features an NVG-compatible cockpit, modernized navigation system and updated countermeasures systems. It’s designed to carry all major ‘dumb’ munitions, laser guided weapons from both French/US arsenals, the Exocet anti-ship missile and the ARMAT anti-radar missile. In 2001, the aircraft was further upgraded with improved capabilities. Italeri kits can be hit or miss but so far, I’ve been lucky. The previous Italeri kit (the A-6E Intruder) I previewed looked to be a good kit. What about this one? The kit comes in the typical Italeri side opening box. There are two main trees of parts and 1 clear canopy tree in a plastic bag. Not much protection I must say, but at least there are no parts that fell off the tree. 58 parts is just right in my opinion so you won’t get bogged down during assembly. The kit comes with a centerline external fuel tank. The typical wing mounted fuel tanks are only available in Italeri’s Rafale release. It also comes with what looks like two air-to-air and two air-to-surface missiles. Not having any knowledge in French weapons, I can’t say much about whether they are accurate. However, they do look a but simplistic in my opinion. A quick look at the sprues indicate a decently molded kit. It’s a mixed bag of recessed and raised panel lines. The majority of the aircraft has recessed lines while the pylons and the centerline fuel tank all have raised panel lines. 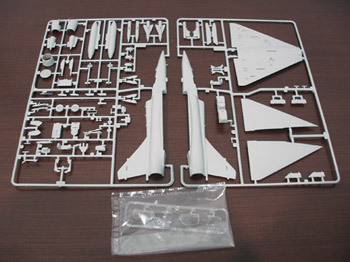 The kit is not as detailed as something like the Hasegawa F-14D kit, but the details are more than acceptable for any modeler. I find that compared to a typical Hasegawa kit, this one has deeper recessed lines. The good thing about that is of course it’s harder to obliterate the panel lines during the assembly stage. However, some of the panel lines do look a bit out of scale. I’m not that much of a stickler of that though. The seats (which I think makes or breaks a cockpit) is decently molded and should be more than adequate. The control surfaces also comes with raised details which is a pleasant surprise. I was expecting the standard decals-for-cockpit-controls things. The landing gear doors are also molded in the open position so doing the Mirage 2000D in-flight will require a bit of modding. The landing gear also has decent details as expected from Italeri. Decals options aplenty. No less than four! Italeri only gives the major stencils athough that’s not a big problem for me. Registration is quite OK although my sample has started to yellow somewhat. I just have to get it shined by the Sun abit and the yellow should be easily gone. By all accounts, Italeri decals are good. It’s just a pity they didn’t include an option to do an in-service French AF Mirage. 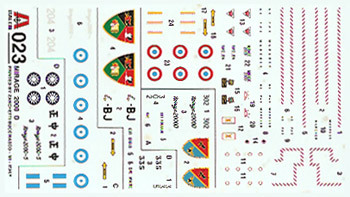 I bought this kit knowing full well it was released one year BEFORE the actual Mirage 2000D was introduced into French service. Expecting some mistakes in the kit, I surfed around the Internet for some info on the kit. From what I could gather, there were some major mistakes: the real Mirage 2000D doesn’t have a pitot tube and the cockpit is located 5mm too far back on the kit. 5mm doesn’t sound like a lot but in 1/72 scale, that’s big enough to actually somewhat change the shape and look of the Mirage. I’m not sure at this point whether it’s an easy thing to fix to be honest or for that matter, whether I should just ignore the mistake. We’ll see. This is so far the only game in town for the Mirage 2000D in 72 scale. If you can live with the inaccuracies then there’s no reason why you shouldn’t pick one up. It looks like a Mirage 2000D from two feet away anyway.